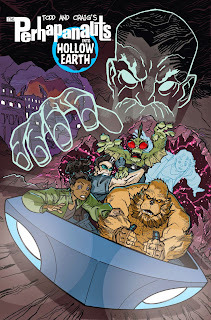 perhapablog... and other ramblings: THE PERHAPANAUTS KICKSTARTER CAMPAIGN LAUNCHES MONDAY MAY 25! THE PERHAPANAUTS KICKSTARTER CAMPAIGN LAUNCHES MONDAY MAY 25! 54 story pages of full color, inner earth, crypotzoological action, adventure and humor (so, technically a 64 page book)... written by Todd (Impulse, Tellos, Sensational Spider-man) Dezago with art and colors by Craig (Impulse, Batman Beyond, Iron Man: Armor Wars) Rousseau.